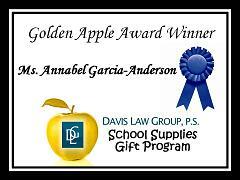 The personal injury attorneys at Davis Law Group, P.S., a Seattle law firm, is pleased to announce that Annabel Garcia-Andersen is a recipient of the Davis Law Group School Supplies Gift Program. Ms. Garcia-Anderson is a preschool teacher at Dunlap Elementary School in Seattle, WA. Garcia-Anderson teaches two (morning and afternoon) preschool classes where children can learn pre-academic and social skills. She works with a number of special needs students with Autism and other developmental delays. Annabel spends hundreds of dollars of her own money each year on school supplies. She plans to use the Davis Law Group School Supplies Gift to purchase craft items that will help children enhance their fine motor, self expression and communication skills. Attorney Chris Davis and his wife started a program to help public school teachers get extra classroom supplies without having to spend their own money. The Davis Law Group School Supplies Gift Program gives a $100 Office Depot gift card each week to a deserving Seattle Public school teacher and his/her class. Anyone can nominate a teacher for this program, teachers, and students, parents, and administrators.